SATURDAY COOKING: PERSIAN CHICKEN STEW WITH POMEGRANATE. I know I have already a million cookbooks, but I couldn’t resist buying this one recently: “One pot favourites” by Pete Evans. He is the king of paleo here in Australia, and a judge on My Kitchen Rules (TV programme). I like a lot of the recipes, even though there is a bit of coconut oil and bone broth going on. Not to worry, vegetable oil or olive oil work, so does plain stock. This PERSIAN CHICKEN STEW WITH POMEGRANATE recipe is easy to make and even though it looks quite “brown” and ugly when it starts cooking, the end result is delicious and very tasty. Place the walnuts in the bowl of a food processor and whiz until coarsely ground. Set aside. Melt 2 tablespoons of the oil in a large frying pan over medium-high heat. Add the chicken in batches, season with salt and pepper and cook for 2 minutes on all sides until golden, then remove from the pan. Melt the remaining oil in the pan over medium heat, add the onion and sauté until translucent, about 5-6 minutes. Add the garlic and cook for 1 minute until soft. Add the spices and cook for a further 30 seconds. Return the chicken pieces to the pan, then pour in the broth. Bring to the boil, reduce the heat to low, cover and simmer gently for 30 minutes. Stir in the walnuts, pomegranate molasses and sugar (if using). For a stronger sweet and sour flavour, add another tablespoon each of molasses and sugar. Continue to cook, stirring occasionally for 1 hour until the chicken is tender and the sauce has thickened. Season the stew with salt and pepper, scatter on some pomegranate seeds, mint leaves and sumac. I used normal walnuts (not activated), vegetable oil, ground nutmeg and chicken stock. I put 2 tablespoons of molasses and 1 of sugar (use brown sugar if you don’t have coconut sugar). Pete Evans suggests cauliflower rice to be served with this dish (basically, whiz/ pulse cauliflower in a food processor until it looks like rice, and then cook it in oil or fat until softened). 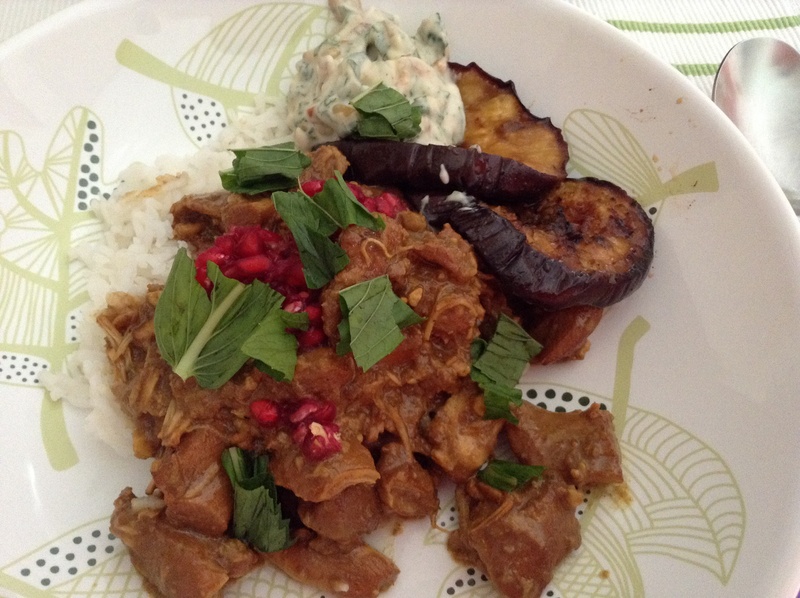 I ate the stew with an eggplant and yogurt salad with pomegranate (I will post the recipe for this at a later date) and rice.